Home / Hina Khan / Latest / Rocky Jaiswal / Hina Khan’s latest pictures are breaking the internet! Hina Khan’s latest pictures are breaking the internet! Hina Khan and Rocky Jaiswal are one of the adorable couple in the telly town. They often shares their pictures on social media and gives us a couple goals. 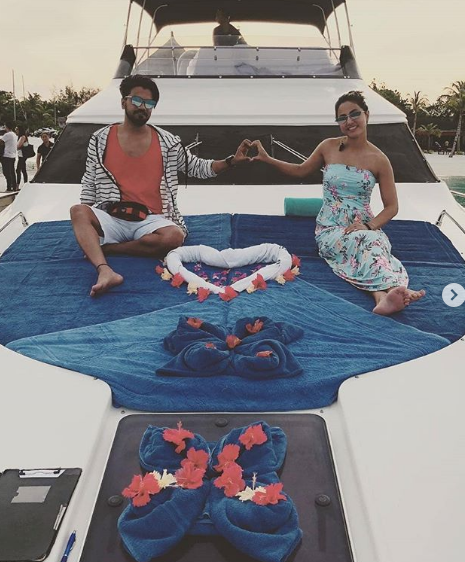 Recently, the couple are enjoying holiday in Maldives and Hina Khan’s latest bikini pictures are breaking the internet. In the pics, Hina can be seen chilling in the middle of the ocean. She looked super hot in an aquamarine monokini. Well, the pictures will surely take your breath away. Apart from spending a relaxed day, Hina Khan also enjoyed a romantic sunset with her beau Rocky Jaiswal. After seeing these pictures, we can say that the couple are having the time of their life. The two looks madly in love with each other in these pics.